Karoo Pred-A-Tours is a lovely game farm in the malaria-free Karoo countryside north west of the historic little town of Cradock and offers guests the chance to visit South Africa’s smaller and less known feline predators. Karoo Pred-A-Tours offers guests a choice of comfortable self-catering and B&B accommodation; the Rondavel, the Cottages and the Bush Camp. 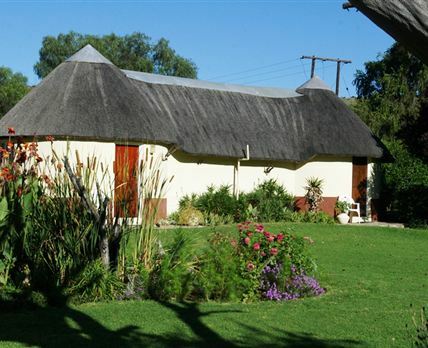 The thatched Rondavel can sleep seven guests and consists of three en-suite bedrooms. The rooms are furnished with double or single bed and the bathrooms have a shower and flush toilet. Bedding, towels, soap and toilet paper is provided and heaters are also available. The unit also has a braai area and is equipped for self-catering. Each of the two Cottages is furnished with a double and a single bed and has an en-suite bathroom. Bedding, towels, soap and toilet paper is provided and heaters are also available. The kitchenette is equipped with a microwave, a toaster, tea and coffee facilities, a bar fridge as well as all cutlery and crockery. Please note the units do not have a stove or an electric hot plate but do have outside braai and gas skottel braais. There is also no cleaning service for self-catering. Cellphone reception is available and Wi-Fi, sold per Gig, as well as a laundry and ironing service is available at an additional cost. For the more adventurous, there is also camping in the veld and guests need to bring all their own essentials. Provided at the camp is a bucket shower, a long drop toilet, a boiling pot to heat water, a bucket to transfer water to the shower, a braai rooster, a table and chairs, a spade, a rubbish drum and borehole drinking water from the windmill pump. Firewood is also available at an additional cost. Click here to enquire at Karoo Pred-A-Tours.